Maxim Artyomov is an Assistant Professor at Immunology & Pathology Department of Washington University in St.Louis. Dr. Artyomov’s lab applies next generation sequencing and novel computational techniques to address fundamental questions in immunology. His recent work is devoted to development of high-throughput RNA-seq approaches and applications of this technology to uncover relation between genes implicated in autoimmunity through genome-wide association studies. Dr. Artyomov obtained his PhD from MIT at 2009 working at Arup Chakraborty’s lab where he studied stochastic behavior in the signal transduction networks at early stages of T-cell activation. 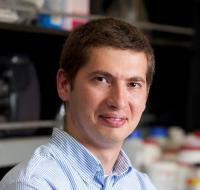 For his postdoctoral studies Dr. Artyomov joined Broad Institute of MIT and Harvard, working with Aviv Regev to explore (both experimentally and computationally) the transcriptional networks that govern activation of dendritic cells in response to immune stimuli. Dr. Artyomov also serves as Co-Chair of Scientiﬁc Advisory Board (along with Doug Lauffenburger) for Cambridge based Immuneering Inc.